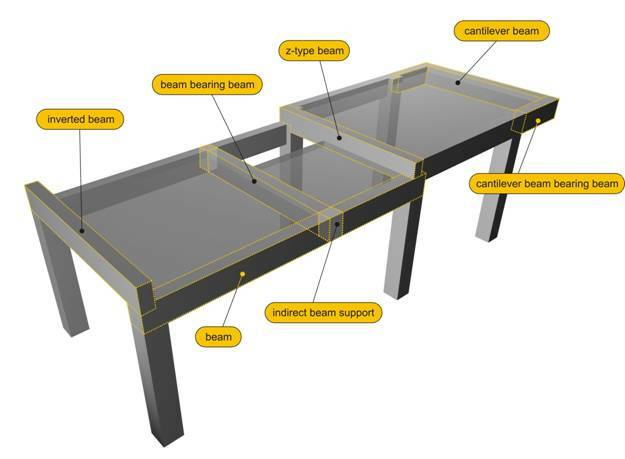 Beams are the vertical or sloping bearing elements of the structural system that connect col-umns and support slabs. Various types of beams "project: beams"
When beams support slabs, they interact with them thus forming a “T-shaped” section beam. The level of the slabs compared to the level of the beams results in the formation of common beams, inverted beams or “Z-shaped” beams. Generally beams are supported by columns (beam to column connection). However, sometimes one or both beam ends are supported by another beam (beam to beam connection) and other times only one end is supported by a column or beam while the other end has no support at all. The beam supported only in one end is called cantilever. The beam to column connection is called direct support and the beam to beam connection is called indirect support. The most commonly used beam is the one supported by two columns and the most scarcely used is the cantilever beam. Indirect supports should be rarely used and only when there is re-ally no alternative solution. In sloped roofs, both beams and slabs have cross sections and supports like the ones men-tioned above but they are sloped.